The preeminent American portrait painter of his period, active mainly in Philadelphia. He was born in England, but went to America as a child. 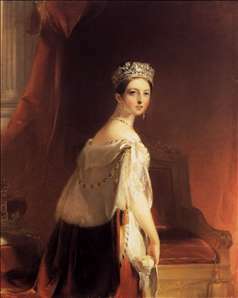 Subsequently he made two visits to England, in 1809, when he studied with West, and in 1837-38, to paint Queen Victoria for the St George Society of Philadelphia (a preliminary version is in the Wallace Collection, London). His style, distinguished by fluid, glossy brushwork and romantic warmth and dash, reveals his great admiration for Lawrence. In his later work, however, he tended towards a genteel sentimentality. Sully was highly successful and extremely productive. He is said to have painted some 2,000 portraits (he also made miniatures), but his best-known work is probably one of his (also very numerous) history paintings - Washington Crossing the Delaware (Museum of Fine Arts, Boston, 1819). See more details about "Queen Victoria"